While Republican Gov. Larry Hogan and his Democratic challenger Ben Jealous crisscross Maryland and trade barbs ahead of the upcoming election, the residents of Baltimore City go about their lives with a steady drumbeat of grim news reports in the background. As part of the series, "Voter Voices," WTOP talked to voters at Baltimore's famed Lexington Market about what they want to hear the candidates discuss on the campaign trail. This story is part of the series, “Voter Voices.” WTOP asked voters across Maryland what issues concerned them, and who would be getting their vote in the upcoming election for governor. Other chapters have included stops in Montgomery County, Howard County, Frederick County, and Prince George’s and Calvert counties. BALTIMORE, Md. — While Republican Gov. Larry Hogan and his Democratic challenger Ben Jealous crisscross the state and trade barbs ahead of the upcoming election, residents of Baltimore City go about their lives with a steady drumbeat of grim news reports in the background. The city’s tally of homicides and opioid-related overdoses continues to tick upward. In the first quarter of 2018, there were 221 opioid-related deaths, up from 159 for the same period last year. As of Thursday, Baltimore had recorded 244 homicides, with 44 recorded in a period of just 30 days. The city’s police department has been in turmoil, with a succession of police commissioners leaving — the latest candidate for the job, Interim Commissioner Gary Tuggle, announced he’d withdrawn from consideration for the top spot last week. The police department’s own spokesman, whose younger brother was shot to death last summer, also resigned, saying he’d had it with the “political turmoil” swirling around the department. 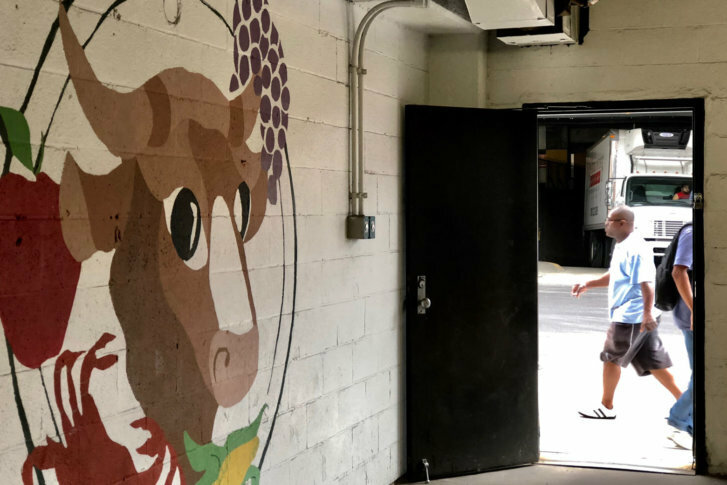 But at Baltimore’s Lexington Market, where vendors offer everything from fresh fish and fruit to baked goods, Leo Fonseca, who introduces himself as “Mr. Leo,” is relentlessly sunny, offering a broad smile and warm greeting to everyone who approaches his kiosk where Avon products are on offer. “I’m a people’s person!” he declares with a laugh, inviting passers-by to check out the latest products, and pointing out a top-seller: the Skin So Soft cream. It not only moisturizes, but customers tell him it keeps mosquitoes at bay, too, he says. When a reporter asks to attach a small microphone to his collar for an interview he says yes, but then asks: “You sure you’re not going to kill me now?” before bursting into laughter. Bruce DePuyt, a senior reporter with Maryland Matters, said Jealous’ strategy has been to target areas where he can expect to get support and to push for high turnout. The campaign is banking on Baltimore being once of those places. “They believe they can reach and motivate the people they need to turn out at the polls. In some cases, they’re people who haven’t voted before because they’re very young, or they’re people who don’t tend to vote, but who might be motivated to vote this time,” DePuyt said of the Jealous campaign. Asked about the upcoming governor’s race, Fonseca says he hasn’t voted in years. “I haven’t voted in a while. I’m being truthful,” he said. Though he doesn’t vote, he’s got a request for whoever ends up as governor of Maryland: Help get Baltimore City’s violent crime under control. “I would like for the citizens of Baltimore to be able to come out their house whenever you want to, sit on your porch, whenever you want to — without the little young people that’ll mess with you,” he said, referring to the April killings of a 65-year-old woman and a 22-year-old man who were shot to death as they sat on their porch on West Mulberry Street. Fonseca draws a direct line between the violence and the city’s opioid crisis. “If they got rid of the drugs, they’d get rid of a lot of the nonsense,” he said. While Fonseca talked to a reporter, another man, Lawrence Green, stopped by to ask for change for a parking meter. Green handed over a $20 bill and Fonseca joked, “That’ll cost you $38!” and then, still laughing, he broke the $20. As Green walked to the parking meter to avoid a ticket, he said he’s still considering who to vote for in the governor’s race. Green said he’s seen Hogan’s television ads and said he thinks that Jealous needs to catch up. Still, Green said that’s not an automatic vote for Jealous. “I have to wait and see what type of information I’m going to get on Ben Jealous,” he said. Wylie Shaw ambles on over to finish a cup of coffee and chat with Fonseca. “I never seen the politics go off the rails like it is now,” he said. A registered Democrat, Shaw said he watches the news like a hawk ever since President Donald Trump was elected. “I feel as though he’s messing the country up, big time,” Shaw said of Trump. Democrats have tried, and in many cases, failed, to link Hogan, a Republican, to the Trump administration. It’s a comparison that has rankled Hogan, who complained to reporters about it in news conferences soon after Trump was elected. Robert Carter, who was on crutches after the recent amputation of one of his legs, came over to catch up with Fonseca and sign a card for a friend who recently passed away. Carter said no matter the party, politicians tend to overpromise and underperform. A veteran who used to be a registered Democrat and is now unaffiliated, he takes a harsh view of Jealous. “Nobody knows Jealous. Just like Anthony Brown,” he said, referring to the former Maryland lieutenant governor who ran against Hogan in 2014. (Brown now serves in Congress). He sees the same thing happening in the case of Ben Jealous, who’s touted his time as president of the NAACP and his family ties to Baltimore. “What else did he do? Seriously, what did he do?” Carter asked. Todd Eberly, associate professor of political science at St. Mary’s College of Maryland, said Democrats thought they might have more leverage over Hogan in Baltimore. “Democrats have sort of counted on the idea that maybe they could use the cancellation of the planned Red Line in Baltimore City to undermine support for Larry Hogan,” he said. But the subject of the project that was left unfunded by Hogan in 2015 hasn’t affected the governor’s performance in the polls, where Hogan is 18 to 20 points ahead of Jealous. A reluctant vote for Hogan? Carter said the death of Freddie Gray, a 25-old man who died in the back of a police van in 2015, remains a divisive issue. While the city grapples with an accelerating homicide rate and an opioid crisis that has exacted a heavy toll, there’s little trust in the police. The department has struggled to attract and retain leaders, and even the police department’s spokesman, TJ Smith, recently stepped down, citing what he called “a systematic failure in policing in Baltimore”. Turned off Democrats by policies dating back to then Mayor Martin O’Malley’s “zero tolerance” approach to street crime in which African-Americans were subject to being stopped and frisked, sometimes on flimsy grounds, Carter said he’ll seriously consider voting for Hogan. But Carter says his won’t be an enthusiastic vote. It’s not because he doesn’t like Hogan; he described the governor as someone “who really does seem to care.” But because he said politics follows the money in places, such as Montgomery and Prince George’s Counties.